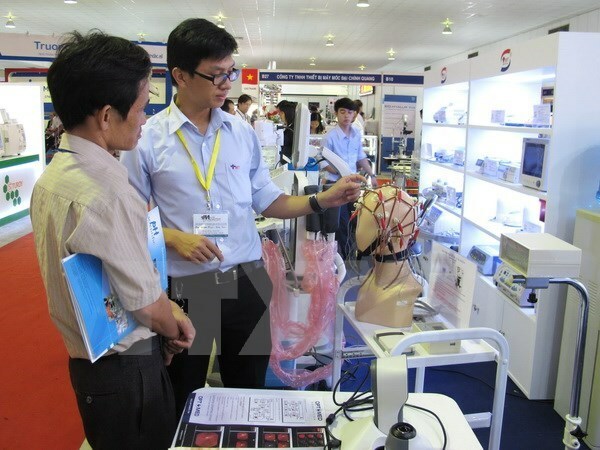 Over 250 pharmaceutical enterprises and organisations from 25 countries and territories showcase their products at the 15 th Vietnam International Hospital, Medical and Pharmaceutical Exhibition opened in Ho Chi Minh City on August 20. On the display across 300 booths are medical and laboratory products, pharmaceutical processing and packaging machinery, healthcare and beauty products, and ophthalmological and dental products, among others. The highlight of the three-day exhibition is the presence of domestic booths featuring herbal products which have been sold in foreign markets such as Russia, Singapore and Myanmar. According to Bui Thi Thanh An, Deputy Head of the Vietnam Trade Promotion Agency under Ministry of Industry and Trade, the exhibition will offer an opportunity for exhibitors to exchange experience, seek counterparts, join ventures and enlarge market shares. During the exhibition, there will be conference introducing the Vietnam medical and pharmaceutical market, trading business policies in Vietnam as well as field trips to the municipal hospitals, helping foreign enterprises gain practical views on demands for healthcare in Vietnam.